Mitchell J. 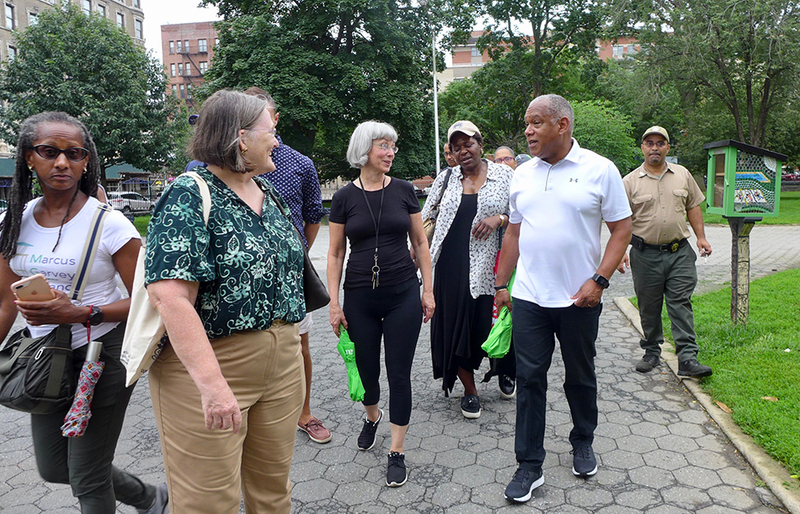 Silver, Commissioner of the New York City Department of Parks and Recreation, along with William T. Castro, Manhattan Borough Commissioner, NYC Parks Department, met with Connie Lee, President of the Marcus Garvey Park Alliance, several members of her Board, and Friends of Marcus Garvey Park Alliance, for a tour of Marcus Garvey Park in East Harlem today. Meeting early at Pelham Fritz Center, the tour began a working walk-through, stopping for notes on potential projects and improvements. Above photo, at 120th Street and Fifth Avenue side of the park. 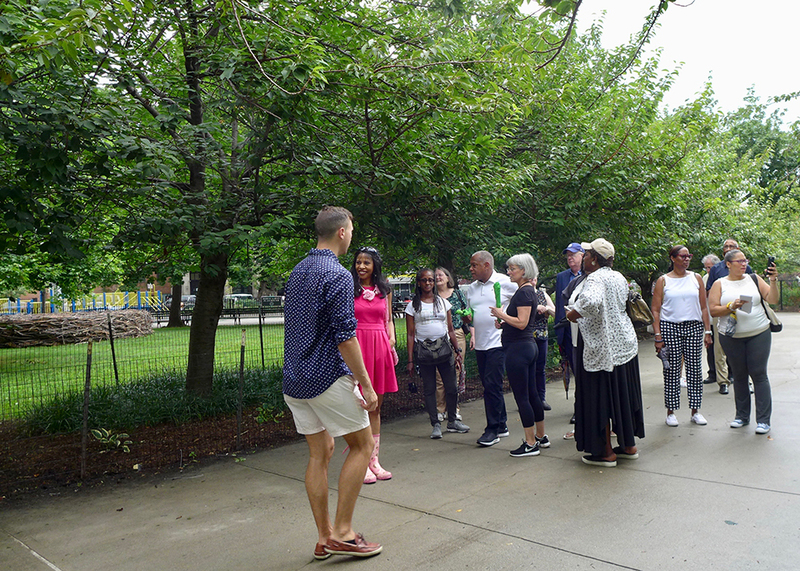 Continuing on along the 124th Street side of the Park, near Madison Avenue, the group passed by the most recent art installation, Maren Hassinger: Monuments, a joint project with Studio Museum in Harlem’s inHarlem project and the Marcus Garvey Park Alliance. 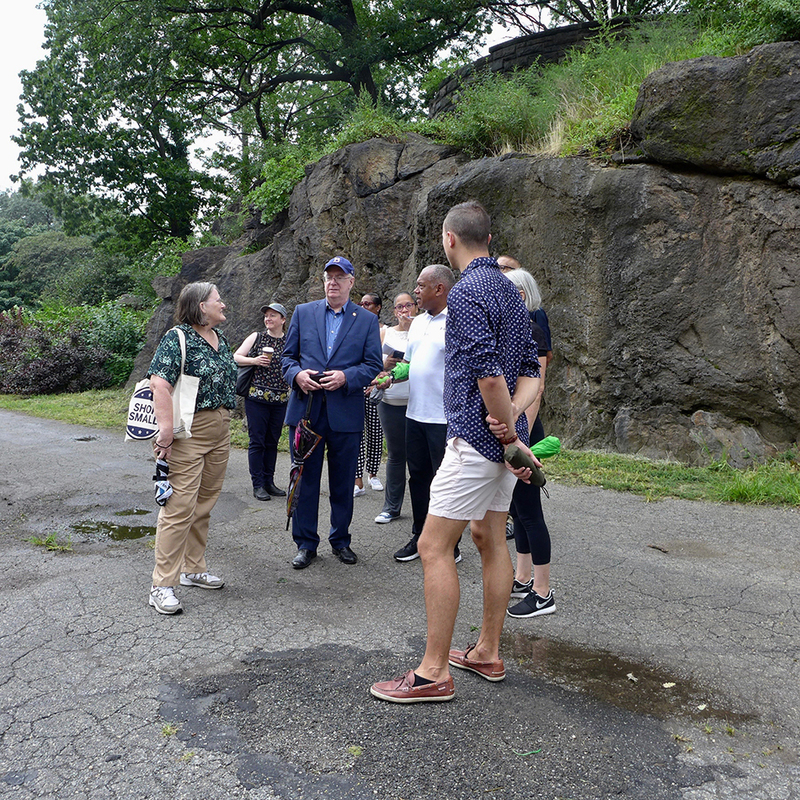 Commissioner Silver views this as a time to not only review necessary improvements to this particular park, but also what the Commissioner feels is necessary time spent with the Alliance Board Members and the community, listening to problems and concerns in a Park they frequent everyday. It is what he calls ~ #parkequity. 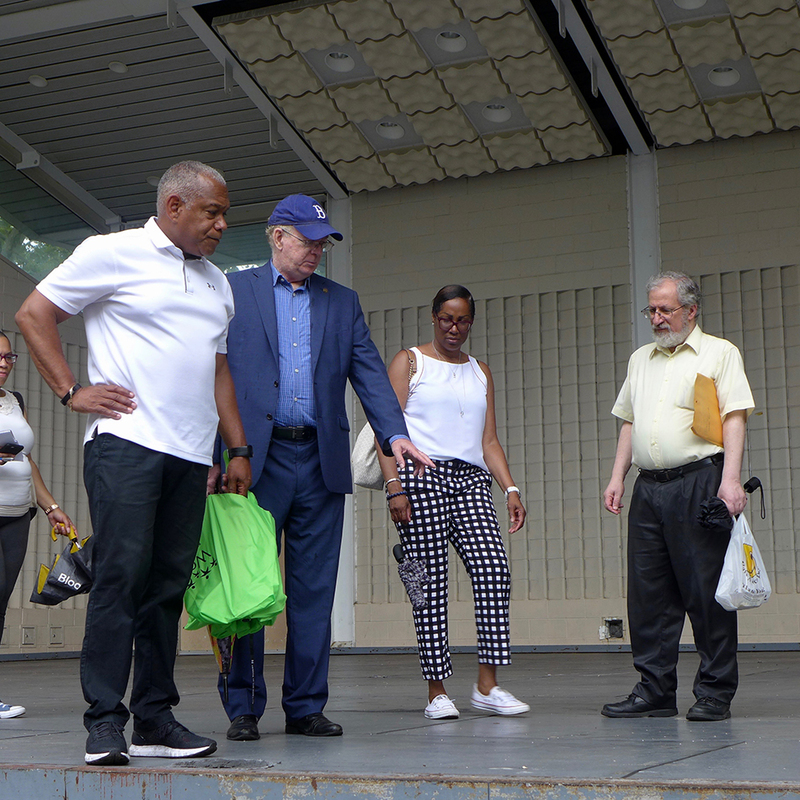 The walk-through included carefully checking walkways, paths, the basketball court, playgrounds, fencing, structures including pool, community center, ongoing project of a new restroom facility, and the amphitheater. 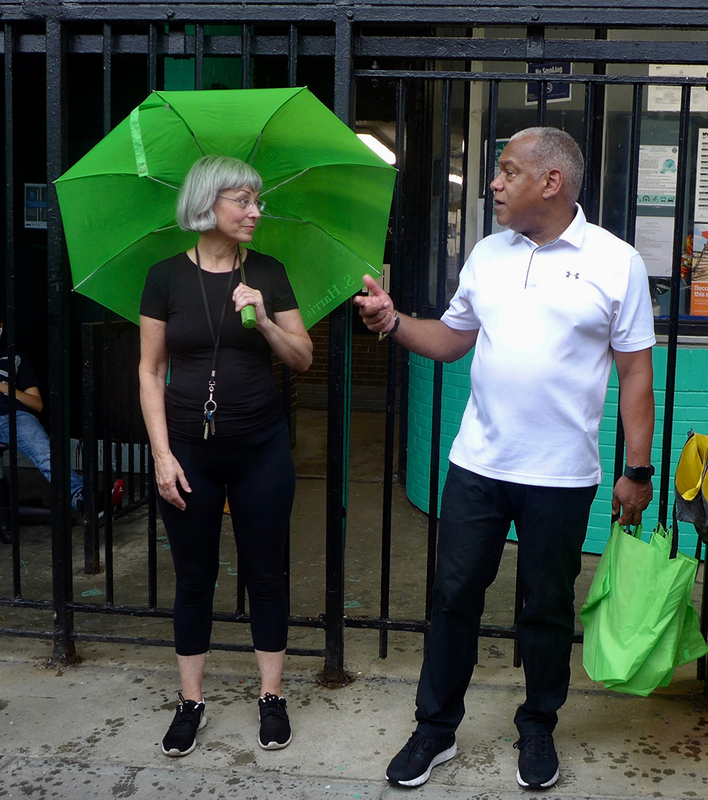 With occasional downpours, and umbrellas going up and down, the tour group grew as the morning progressed to include more Board Members and members of the community. The walk-through passed by several Marcus Garvey Park Alliance projects like the three Little Free Library’s, strategically located along the 124th Street side of the Park, with books for younger children set in the Little Library located near Mt Morris Park West ~ the lawn where the Marcus Garvey Park Alliance holds their weekly Children’s Reading Circle, where local authors and artists donate their talents, entertaining children who sit on colorful blankets laid out under the trees every Wednesday from 10:30am to Noon during the summer months. 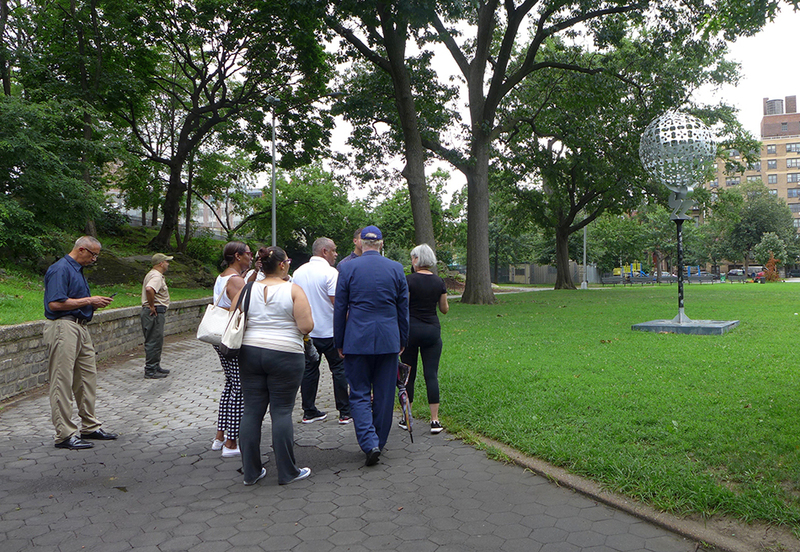 Below, the group passed by the Madison Avenue side of the Park near 123rd Street, with a view of current art installation, Atlas of the Third Millennium by the artist Jorge Luis Rodriguez. 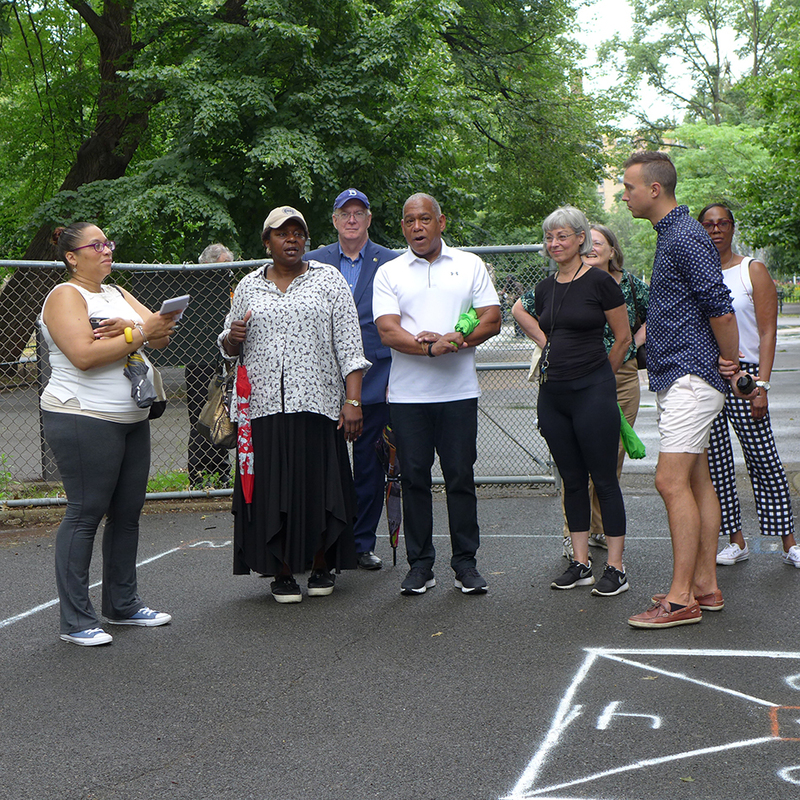 “This installation will be replaced by a new artist on October 1”, said Connie Lee, who is also the President of Public Art Initiative, working closely with other parks in the area, and on the Board of Landmarks East Harlem, which had a recent success, landmarking three structures in East Harlem. Overlooking the lawn housing current art installation, Atlas. To the left of Atlas, is the Drummers Circle, where local drummers play their instruments every Saturday, weather permitting. The Marcus Garvey Park Alliance also holds a Food Market each Saturday from 9:30am to 4:00pm on 124th Street and Mt Morris Park West. 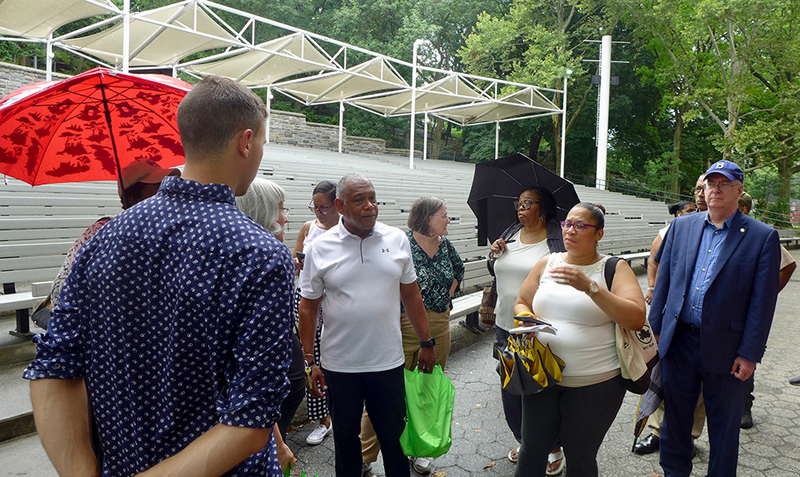 Above and below, the Richard Rogers Amphitheater and stage, where the public enjoys the Classical Theater of Harlem, Jazzmobile, Summer Stage Charlie Parker Jazz Festival and many many other events ~ Free and open to the public. 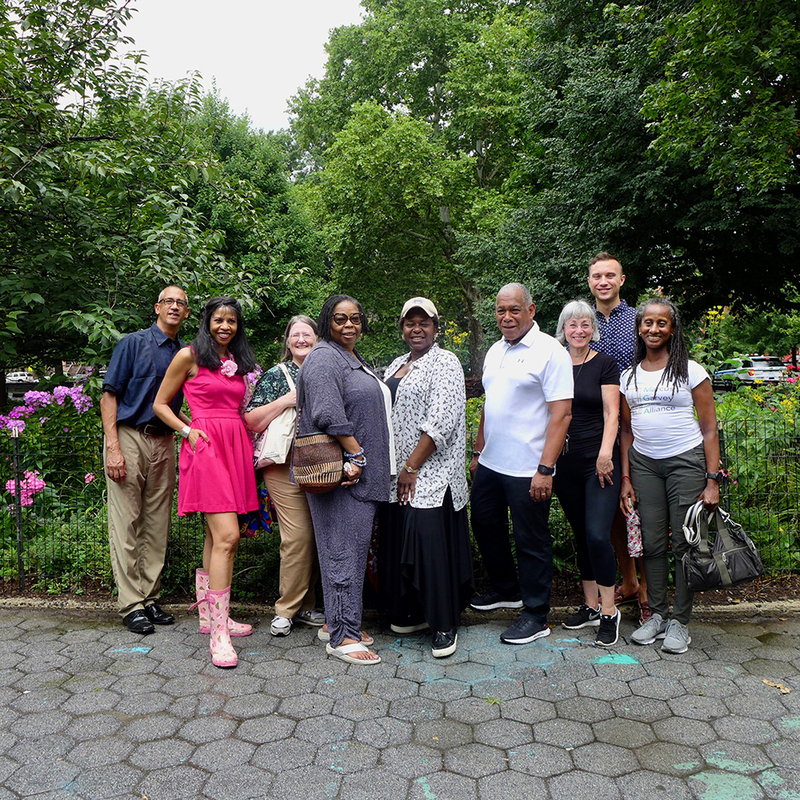 For the third year in a row, the Alliance welcomed a Sing for Hope Piano, on the 124th Street side of the Park at Fifth Avenue ~ manned by a community of Piano Buddies, and enjoyed by all. This year, Sing for Hope surprised Marcus Garvey Park with a pop-up Piano Day including the Sing for Hope Mini! 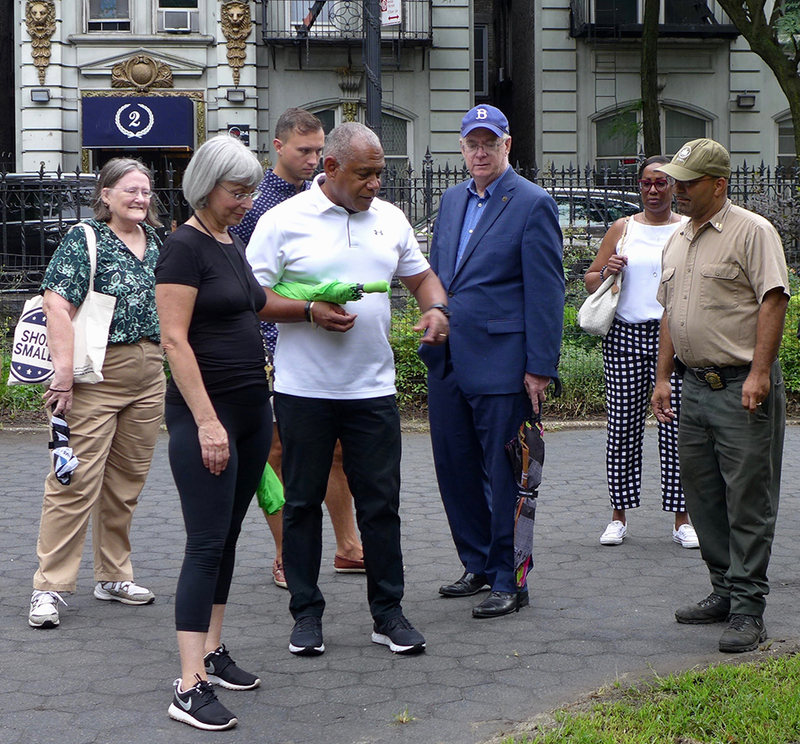 One of the most notable and historic structures in Marcus Garvey Park is the Harlem Fire Watchtower, which was removed from the Acropolis in 2015 for a major restoration, and will be returned later this year. 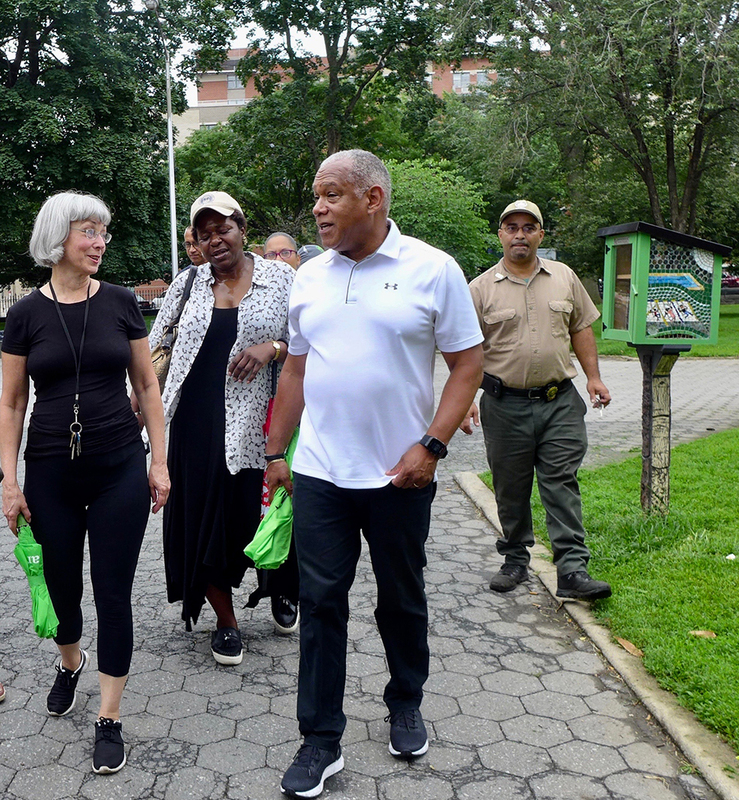 As Parks Commissioner, Mitchell Silver oversees management, planning and operations of nearly 30,000 acres of parkland, which includes parks, playgrounds, beaches, marinas, recreation centers, wilderness areas and other assets. We follow the Commissioner on Twitter ~ and he keeps us busy! 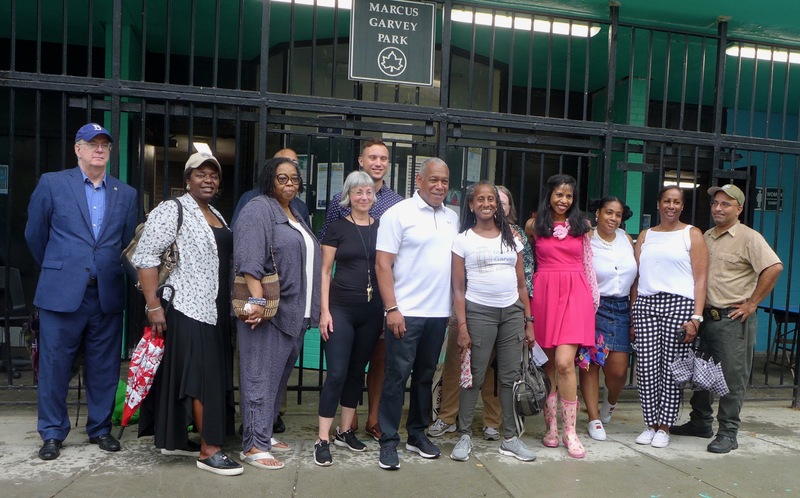 You can follow Marcus Garvey Park Alliance on their Website or on Facebook to keep up with what’s happening in the Park. Love plants? 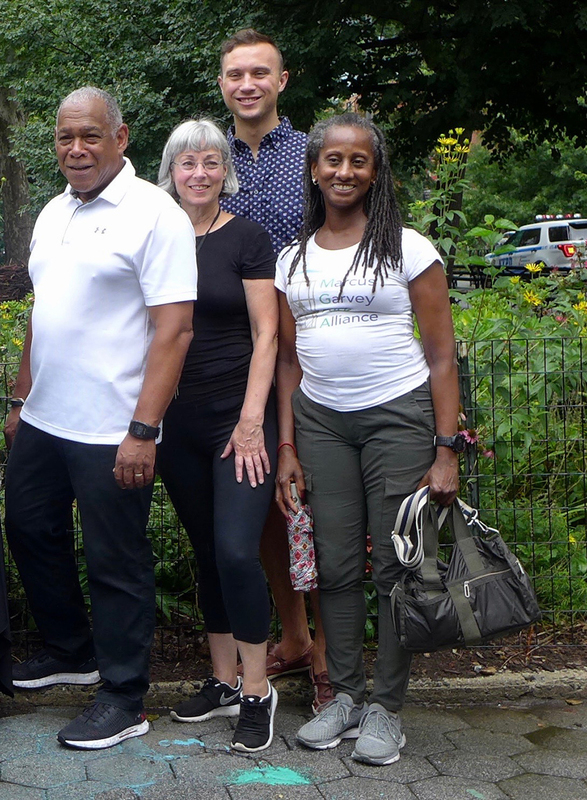 Become a Marcus Garvey Park Alliance volunteer. Connect with them on their website.